Combining durability, technology and style. Giving classic timekeeping a distinctive edge. Showcasing traditional sophistication with sport-inspired style. View the full range of Tissot watches. 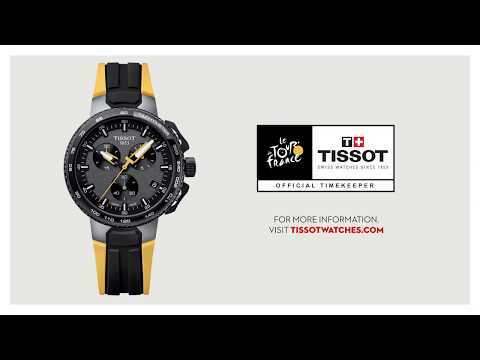 Tissot are the Official Timekeepers of the Tour de France. To celebrate the event, the brand dedicated their new special edition T Race watch to Tour de France. Tissot has been a watch industry leader ever since its establishment in 1853. Founded in the Swiss mountain town of Le Locle, a centre of fine Swiss watch making, Tissot is a true Swiss heritage brand with a global presence in over 165 countries worldwide. Tissot watches feature premium materials which are designed and developed to be at the forefront of watch innovation. Tissot is renowned for being one of the most innovative watch brands in the industry. From the launch of the first ever anti-magnetic watch in 1930 to T-Touch the cutting-edge touch-screen technology timepiece, first launched in 2000, Tissot is a true innovator by tradition. The breadth and innovation of the Tissot range is due to the development of high-tech products, special materials and advanced functionality. Tissot watches offer a broader, more versatile range of high quality timepieces at more attractive prices than other traditional Swiss watch brands. Offering 'democratic luxury' to Ernest Jones customers, the Tissot range has something for everyone. From sports chronograph watches to classic watches for work or special occasions, Tissot also offer automatic and gold-plated watches, along with the technologically ground breaking T-Touch, touch screen watches. Tissot underlines its core values of performance, precision, and new standards by acting as official timekeeper and partner of many disciplines, including, basketball with the NBA, FIBA and CBA; cycling with the Tour de France and the UCI World Cycling Championships; motorsports with MotoGPTM and the FIM World Superbike Championship and rugby with the RBS 6 Nations Championship, TOP14, the European Rugby Champions and Challenge Cups. It is also the Official Timekeeper of the World Championships of fencing and ice hockey and of the AFL.